Content management/strategy and the business of tech comm were my two focus areas during the tekom/tcworld conference in Wiesbaden, Germany, last week, and I will summarise some of the sessions I attended in several blog posts. Paul Perrotta from Juniper Networks offered two sessions on change management in tech comm. He reported on his unit’s journey from siloed, bickering, intransparent groups to a more efficient Information Experience (iX) organization. Part of the problem is that we in tech comm are often pretty bad at saying what we do and what value we provide to the company and to customers. Instead, “docs happen” frequently in a black box. If you measure how well-regarded each unit is by their budget increases, a black box is not a good place to be in, because it won’t get you better funding. Executives don’t know (and don’t need to know) how tech comm works. But they need to know whether it’s successful and how it helps them be successful. And whether 8 dollars spent on it will increase their bottom line by 10. Doing more (work) with less (resources). Deferring costs to a less certain future. Make improvements manageable by chunking them up into strategic initiatives. Dissolve the documentation siloes by architecting and governing all content as a whole. Improve content to make it complete, searchable and findable. Connecting tech comm with marketing, sales and support to contribute to and benefit from the same content. Rebrand tech comm as information experience to emphasize its contribution to the customers’ experience. Focus on users and engage with them, for example, via user satisfaction surveys, feedback, social media. Install an iX customer advisory board which meets regularly. Seek out managers with the power and money to help you and map out your allies throughout the organization. Link tech comm to development metrics where possible. With proven competence, you can aim for 5% of R&D spend which is industry best practice in IT. Ask how much of the product price tags the documentation is worth. Show what (else) you could do with X more money. Many customers are happy to offer feedback if they find they get heard, and tech comm improves as a result. An ongoing discussion with users builds trust and customer loyalty. Commonly governed content becomes more reliable and more easily findable for employees and customers alike. Managers will support you because your success is their success of you demonstrate competence and that it’s easy for them to help you. If you map your projects to executives’ objectives, you can clarify what you can and cannot do with available resources. To measure their achievements, tech comm quality metrics are not enough; you need customer engagement/experience metrics as well. As a side effect, you will have to abandon an implicit ethos that treats tech comm as special, as an art that creates books. The business and managing of tech comm was the predominant topic of my TCUK13 experience, as I reflect some more on the sessions I attended and the conversations I joined. Improve several individual procedures for quick wins: Single sourcing reduced translation efforts. Automating the translation round-trip cut out costly manual layout efforts. Bring in a content management system to reap the full benefit from single sourcing and topic-based authoring. This helped to reduce the number of redundant topics and to make localization even more efficient. Easier administration of topics than of larger content chunks before. It’s also easier to solicit reviews for smaller stand-alone chunks. Faster, more consistent creation of deliverables for several product variants thanks to better use of standard templates. Documentation processes align well with recently introduced agile development processes. More efficient, streamlined workflow thanks to better integration between documentation and localization. I really enjoyed Andrew’s presentation. It showed that projects to improve tech comm do work out, even if you don’t always see past the next stage, and you may have to adopt due to other changes in the company. Adrian Warman from IBM hooked up two important tech comm issues, accessibility and documentation for mobile, into a survey session. Accessibility makes it easier for everyone to fit in, participate and contribute, irrespective of disabilities. In short, it ensures that a user’s disability does not mean a personal disadvantage. For tech comm, this means that sufficient documentation is accessible. For example, if your online help in HTML is accessible, it’s not necessary to make the same contents in PDF accessible as well – or vice versa, as the case may be. Adrian advised us to keep an eye on “EU mandate M 376” which may soon make some level of accessibility mandatory for products traded within the EU. Mobile (smartphones and tablets) for tech comm means not just a technology, but an expectation, a mindset. It’s more than simply fitting our output onto smaller screens. Its different dimensions of interactivity, such as progressive disclosure and user-generated content, challenges us tech writers to re-think how to best convey an idea. Which is the best taxonomy that supports both, mobile devices and accessibility? I don’t think there was a lot of new, revolutionary content here, but since I haven’t dealt much with either topic so far, it was a welcome introduction that was concise and well presented. Edward reported on his twitter project @uselessassist where he “Retweets to remind organizations of the frustration and negative emotions that result from poorly prepared assistance.” He presented many examples of poor user assistance. Some people complained about insufficient instructions, whether they had not enough images or only images. Some found the instructions too long (“I know how to prepare toast!”) or too short or redundant. Some pointed out typos or bad translations. This was a very entertaining session – and you can easily get the gist of it by simply looking up the account or following the twitter feed. It’s anecdotal evidence in real-time that users actually do read the manual – or at least try to. – Feel free to leave comments about any of the sessions, whether you have attended them or not. How to disrupt techcomm in your organization? If you need to “disrupt” your tech comm content, I believe it’s more beneficial to integrate content across the organization than just to get tech comm to become more business-oriented or more like marketing. A recurring discussion is that tech comm needs to be more business-like to be justifiable in the future, not only on this blog but also elsewhere. Proponents of this view definitely have a point, if only because tech comm is often seen as a cost center and finds it hard to claim a return on investment. Tech comm risks to abandon its benefits to users and quality standards in an attempt to be “more like marketing”. Managers may risk permanent damage to the documentation of their product without solving the bigger problem. The bigger problem often is that most content production is inefficient – because it occurs in parallel silos. Many companies have gotten good at making their core business more efficient. But they often neglect secondary production of content which remains inefficient and fragmented. Marketing and tech comm create and maintain separate content to explain the benefits of a product. Tech comm and training write separate instruction procedures for manuals and training materials. Once companies wake up to these redundancies, all content-producing units will face pressure to streamline content and make it easier to produce and reuse. This will revolutionize corporate content production and publishing. I think this issue raises two questions for technical communicators. Which kind of content disruption is more beneficial for the organisation and for customers: Folding tech comm into marketing or integrating all content with a corporate content strategy? Does your content serve the product, the company or the customer? Is there a business case for a corporate content strategy? What’s the role of technical communicators in this content disruption: Are they the movers or the movees? Are they shaping the strategy or following suit? What is your personality, clout and position in the organization? Which team has the most mature content and processes to be a candidate to lead any kind of strategic change in content? I think tech comm can lead a content strategy, especially if and when the tech comm team knows more about content than marketing or training or other content producers. If DITA seems like a good idea, but you cannot make the case for it, you can move towards structured writing and make your documentation “future-proof” by meeting the standard half-way. At the company I work for, we tech writers created manuals in parallel, but separate to online help. Over time, this gave us a documentation set that was inconsistent in places and hard to maintain to boot. Topic-based authoring which reuses topics in print and online can fix that, of course. Deciding on the method is one thing, but we also wanted a consistent structure that made the documentation easier and clearer to use – and easier to maintain for us writers. That required a model that specifies which kinds of topics we want to offer, how these topics are structured inside and how they relate to one another. We could create a content inventory of our documentation, analyse and segment it to tease some structure from that. Or we could rely that others had solved a similar problem before and see if we can’t use the wheel someone else had already invented. Turns out the second option was quite feasible: The DITA 1.2 specification gives us about all the structure we need – and more. We left out the parts we didn’t need (for example, some of the more intricate metadata for printed books) and adopted a kind of DITA 1.2 “light” as our information model. Note that I haven’t mentioned any systems or tools so far! Even though it happened in parallel to the rolling out topic-based authoring as our method and DITA light as our information model, the tool selection was mainly driven by our requirements on documentation workflows, structure, deliverables, and budget. The tool that suited us best turned out to be MadCap Flare – even though it doesn’t create or validate DITA! Using our information model in Flare, we believe we get most of the benefits of DITA – and considerable improvement over our less-than-structured legacy content. And speaking to people at WritersUA 2011, it seems that we’re not the only one to move from less-than-structured writing to XML and something “close to DITA”. Technically, we’ve defined the DITA elements we need as divs in the Flare stylesheets, but otherwise use the straight Flare authoring-to-publishing workflow. Flare is agnostic to whether a topic complies with DITA, is somehow structured but not complying or totally unstructured. To us tech writers, the largest benefit of DITA, half-way, is that we can actually do it. We could not have gotten away with DITA, the full monty, which would have required a much longer project, a much bigger migration effort and hence, uncertain ROI. For new topics, we are committed to writing them structured, so they follow the information model. To migrate legacy topics, we’ll have to ensure they have an identifiable topic type and a suitable heading, but we can cleaning up their insides in a “soft fade”, moving them towards structure one by one. This gives us a quicker win than cleaning up literally thousands of topics before having anything to show in the new method, model or system. So we will have been working in Flare and with our home-grown information model for a long while, before all topics actually comply with the model. But then we will have a documentation set which we can feasibly move into real structure, whether we opt for DITA or some other XML-based CMS, with or without a CMS. This post is an elaboration of a comment thread on the “Why DITA?” guest post on Keith Soltys’ Core Dump 2.0 blog. Technical communications and content strategy have a lot to say to each other. Bloggers have frequently related the two disciplines. Tech comm conferences run streams on content strategy, for example, tekom11 dedicated a whole day to the topic. Ray Gallon at tekom. Photo by @umpff, used with permission. Ray’s presentation was very enlightening to me, because he applied content strategy to software development. I create documentation for software applications, so I can relate to creating content for them. In the following, I’ll mainly focus on the first half, but I recommend watching the entire webinar. For the sake of his argument, Ray set the stage by looking at (complex) software developments not as products or tools, but as information-rich interactive environments. Software could thus be an expert system that supports users to make an appropriate decision, e.g., a medical diagnosis. The Content Requirements Worksheet can be very beneficial to future users of a software. 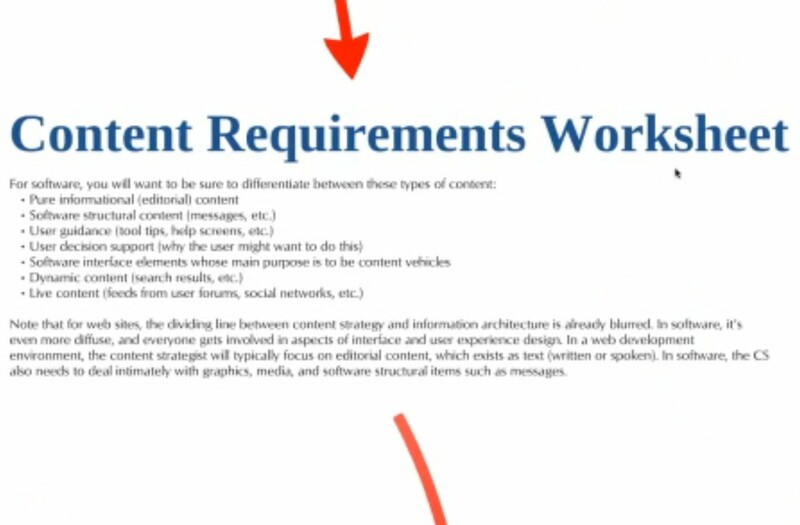 But it presents a challenge to content strategists to get a wide variety of requirements right. That is the opportunity for technical communicators and user experience designers and information architects to pool their skills and join forces. Many tech comms do a bit of, or a lot of, content strategy in their work, and if an organization has a content strategy then everyone, tech comms included, needs to understand it and be on board. So let’s transcend the silos of our systems, their manifold features and the artefacts we’re used to creating. Let’s start with good, thoughtful design from which our users benefit. Is this a good way to relate content strategy to technical communications? Or do you know better ways? Feel free to leave a comment. Structured content is cooler than you may think. As a model for technical communications, it suffers from several misconceptions which prevent that you and your organization get the most out of it. I’ll debunk a couple of misconceptions that I’ve encountered. Each one presents a learning opportunity where you can show a writer, a subject-matter expert or a manager how structured content is actually quite beneficial. Structured content kills creativity, right? Start the topic with a heading; start the heading with a verb. Start the text with an introductory phrase, sentence or paragraph, depending on how much context the procedure requires. Write all procedural steps in a numbered list. I think the argument, taken at face value, misunderstands creativity. Creativity, whether in the arts or in more craft-like professions, is always an expression regulated by rules and confined by boundaries. Think about poems. Ann Rockley (I think) once gave the example of a sonnet, a fine form of poetry which has been around with few changes for centuries. It is highly regulated in terms of number of lines, rhyme scheme, etc. Or think of a haiku: 3 lines of 5 + 7 + 5 syllables, that’s pretty strict. But I’ve never heard a poet claim that the rules kill his or her creativity. So structured writing sets up more obvious rules than you may be used to. With them, it channels creativity to ensure that your writing is more reliable, more accountable and to your readers more useful. Structured writing is mainly different from technical prose, I think – and ultimately just as demanding. In both scenarios, you can ask yourself: Have I put my best sentences into the topic? And in both scenarios you will meet people who think that anybody can write. But the marks of high quality writing are pretty similar in either case: Is the writing clear, consistent, and correct? For you as a writer, structured writing doesn’t so much limit or kill creativity, but it helps you to channel it: You can focus on putting the most useful, most concise documentation on screen or page in consistent structure. It frees you from having to worry about structure, content and layout at the same time: You can focus on content alone, while the structure is given, and the layout is applied separately. For readers, structured writing increases their trust and confidence in the documentation. Whether you spell it out explicitly or leave them to discover it by themselves, structured writing ensures a level of consistency that is hard to achieve by other means. If you’ve found this post helpful, if you disagree or if you know additional benefits of structured content, please leave a comment. I’ll debunk some misconceptions that I’ve encountered. They aren’t exactly wrong, but they miss the big picture. So each one presents a learning opportunity where you can show a writer, a subject-matter expert or a manager how structured content is actually quite beneficial. Structured content means writing topics with a style guide, right? No, but it’s a good start! Structured content plays very well with topic-based authoring and a style guide, but it goes beyond them. Way beyond. To take a favorite example, imagine you’re writing a cookbook with several co-authors. Without topics and a style guide, every writer’s output looks different, though they’re probably all effective and recognizable as recipes. A topic structure gives you some coherence in all recipes. They each might start with a short description with regional and culinary context. Then you have a list of ingredients. Then you have the preparation instructions, probably as a list of steps. You may include preparation time and difficulty. A style guide adds more coherence, this time in layout and maybe sentence structure. You define what headings and sub-headings you use. You decide on metric or imperial measurements. You might regulate that instructions should use imperatives. On the surface, you now have structured content: All recipes share the same structure and layout and similar writing style. You can mix and match topics. If you have 200 recipes like this, you could easily combine them into a dozen different cookbooks, some with a regional theme, one with desserts only, and a vegetarian one. A problem arises when you show ingredients in grams and liters and want to convert them into ounces and pints. You could do that manually for 200 recipes. Or you could ask a developer to write a text manipulator that searches for “grams” and “g” and “kilogram” and “kg”, finds the number preceding it, convert it and hope that you catch everything, and it comes out right. Structured content helps with such conversion, because each topic “knows itself” inside out: Each topic contains markers that identifies it as a recipe. Inside these markers are more markers that set off the intro, the list of ingredients and the step-by-step instructions. Each ingredient on the list identifies an amount, a unit and the actual ingredient. uses aubergines and tomatoes (because they need to go). Benefits and motivation for a new product or module may already be contained in documentation (or even the development specification), so marketing can just reuse it. Setup procedures in a user manual can be reused in tutorials or training materials. Topics written for online help can be reused in manuals.